This set of stamps from 2011 intrigued me and I discovered it was for a Cossack Uprising in 1594-96. I kept a post-it note with bullet points on the postcard to remind me. I have no idea what the squiggle and graphic is in the extra, and I couldn't find a way to translate the Russian. But I did find out about the two men the stamps are honouring. The gentleman on the bottom left is Hyrory Loboda, a Kosh Otaman of the Zaporizhian Cossack Host. A Kosh Otaman is the highest military rank of the Zaporizhian Cossacks in the 16th-18th centuries and Host is an archaic word for army. The Zaporizhian Cossacks lived in central Ukraine. The gentleman on the top right is Severyn Nalyvaiko, leader of the Ukrainian Cossacks who became a folk hero. The uprising was a second failed Cossack rebellion against the Polish-Lithuanian Commonwealth which, at the time, was one of the largest and most populous countries in Europe. The conflict was ultimately won by the Crown of Poland, but two years of warfare and scorched-earth tactics employed by both sides left much of right-bank Ukraine in ruins. My head was spinning trying to detangle all the references and historical dates and places - my military history is astoundingly bad for eastern Europe during the 17th C.
Basically, Ukraine was divided along the Dnieper River into Right-Bank which was under Polish rule, and Left-Bank which was under Russian rule. (one must realize that the Dnieper must be flowing south for this to make sense!). Nalyvaiko was in the Polish army until he decided to organize a paramilitary unit of unregistered Cossacks and peasants and then proceeded to raid several Moldavian and Hungarian towns before invading Belarus. He eventually joined forces with the Loboda and his Zaporizhian Cossack army. Time and fighting went on and the Cossacks started to run out of food and water during a seige. A mutiny arose among the rebels and Loboda was assassinated by Nalyvaiko's supporters who thought he was collaborating with the crown hetman (military leader) of the Polish army. Nalyvaiko was handed over to the Poles by the rebel mutineering Cossacks, supposedly in exchange for their own lives. The Poles thanked them then attacked them anyway and after the rebellion their lands were taken over and given to Polish magnates. Nalyvaiko was tortured and beheaded and put on public display. And he became a legend, with poems and songs and stories written about him, and even a brand of vodka named for him. And a stamp. Fascinating piece of history in these stamps. Great stamps and some new historical facts for me. Interesting stamps on a part of history I didn't know before. Thank you for sharing! 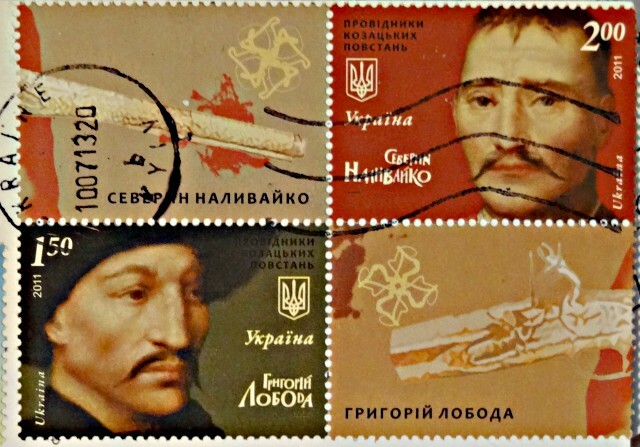 The cyrillic words on the two other stamps show the same names, Григорій Лобода = Grigory Loboda, Северин Наливайко = Severin Nalivaiko. Thank you Heleen! I didn't even notice that the letters were the same on both stamps.